1. The disproportionate role of high‐​profile, hard‐​to‐​predict, and rare events that are beyond the realm of normal expectations in history, science, finance, and technology. 2. The non‐​computability of the probability of the consequential rare events using scientific methods (owing to the very nature of small probabilities). 3. The psychological biases that blind people, both individually and collectively, to uncertainty and to a rare event’s massive role in historical affairs. In other words: A Black Swan is a highly impactful event which was completely unexpected and could not be predicted, but which (due to human biases) is often rationalized after the fact as if it could indeed have been expected at the time. Consider the simple thought experiment that Taleb uses early in the book: A turkey is fed each day. Based on the available data (the amount of food), it thinks itself very clever and surmises that it will continue to receive food forever. Suddenly, one day, the turkey gets its head chopped off. To the turkey, this was completely unexpected; a Black Swan event. After the fact, we rationalize the whole thing and wrap it in a nice narrative. Yes, of course it got its head chopped off; it was just before Thanksgiving, so that’s to be expected. But looking only at the information available to the turkey at the time, it had no way of knowing. Hence the main (high‐​level) point of the book: Don’t be a turkey. Humans have evolved to live in Mediocristan. In this familiar and safe land, no single observation significantly impacts the average. For example, pick a group of 1,000 random humans and measure their weight or height (which are examples of attributes belonging to Mediocristan). The average weight or height would not be significantly impacted if you were to add the single heaviest or tallest human to the group. The bell curve, or normal distribution, adequately represents the statistics of most phenomena in Mediocristan. It is possible to study past data and make predictions for the future, without much risk of loss. Today, however, we live in Extremistan, having seemingly been moved while we were asleep, and now we are slightly disoriented and kind of think we’re still at home. In Extremistan, a single observation can vastly influence the average. Pick a group of 1,000 random humans and look at their wealth (an attribute belonging to Extremistan). Contrary to the Mediocristan attributes, the average wealth will be significantly influenced if you add, say, Bill Gates to the mix. Or you can collect 1,000 random authors, calculate the average book sales and then add J. K. Rowling. In order to orient ourselves in Extremistan, we habitually turn to familiar tools such as the bell curve, not realizing that the normal distribution vastly underestimates the probability and impact of rare events – of Black Swans. 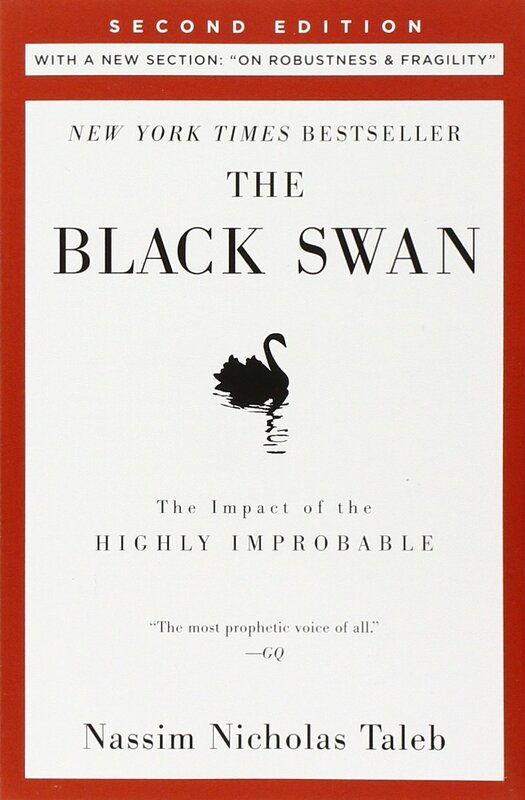 Taleb argues that Black Swans can not be predicted. Much of the book is a diatribe against the use of bell curve‐​based statistical models and methods (or indeed any kind of calculation of risk etc.) in the finance sector, in which Taleb is a long‐​time player. Trying to forecast, extrapolate, and predict Black Swans in Extremistan gives a false sense of security, and is akin to getting lost in the Alps and trying to navigate using a map of the Pyrenees. That is the way financial crises happen. Instead, argues Taleb, we should aim to be robust against negative Black Swans, and increase our exposure to positive Black Swans. Don’t mistake this for your standard “self‐​help” book with quick and dirty actionable steps you can perform (though you get some of that too in the addendum to the second edition). The Black Swan is a philosophical and technical work. It’s generally well written, with Taleb making a compelling case for empiricism, and the book certainly changed the way I view the world (I love those kinds of books). A longer version of Fooled by Randomness? The Black Swan is not perfect, though. While it’s written to be accessible to laypeople, the language isn’t the easiest and the flow could have been better. I found it gets better after a while, though most likely because I got used to it. While some effort may be required, I found it more than worth it. More serious is the fact that the book could have been compressed down to half the size and still gotten the same point across. I don’t really mind the humorous anecdotes, and hearing the same message over and over again in different contexts makes the message easier to understand and remember. Still, Taleb could have cut a significant amount of filler content and autobiographical notes to focus his message. Furthermore, for all his denigration of epistemic arrogance (i.e., knowing less than you think you know), he sure comes across as arrogant and cocksure himself. The general takeaway is that Taleb is an erudite “gentleman philosopher” among philistines and turkeys. It is not something I thought about while reading; indeed, it was even refreshing in a way, but it strikes me now that some might take offense at his tone. Personally I rather enjoyed the book despite these shortcomings. Then again, I have a generally skeptical and fundamentally empirical core, and I have always had a weakness for anti‐​dogmatism and the limits of knowledge, both of which are central aspects of this book. If you are disheartened by the above concerns, or if you try to read it and give up, I’ve seen other reviewers recommending his previous book, Fooled by Randomness. I haven’t read it, but it’s allegedly much more concise and gets the central message across more easily. The Black Swan is a good book on an important concept. It’s ripe with sarcasm, dry wit, humorous anecdotes, satire, and ridicule of the finance sector, which is never a bad thing. However, some might find the language too elaborate, the tone too arrogant, or the book too long for its message. In that case, you might have a better experience with Fooled by Randomness. For me, the idea behind the book was certainly worth the effort. If you are at least mildly intrigued by the topic of the book, do read it. At worst, you’ll read it and move on. At best, it’ll be a great and formative experience. 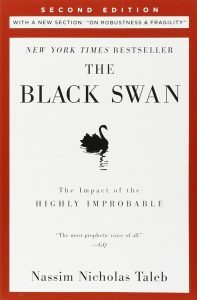 The Black Swan is a good book on an important concept, though it could have been a bit shorter, and the author could have appeared even more credible by dispensing with the cocksureness and opting for a tone more befitting of the book’s theme.